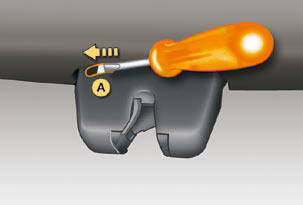 After unlocking the vehicle using the remote control or the key, pull the handle and raise the tailgate. 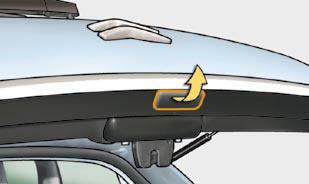 Lower the tailgate using the interior grab handle. - when the vehicle is moving (speed above 6 mph (10 km/h)), this warning lamp comes on, accompanied by an audible signal and a message on the multifunction screen for a few seconds. System for mechanical unlocking of the boot in the event of a battery or central locking malfunction. Fold back the rear benchseat to gain access to the lock from inside the boot. Insert a small screwdriver into hole A of the lock to unlock the tailgate.